This morning, Georgia Gun Owners launched our “Stop Stacey Abrams Gun Control Agenda” Raffle! 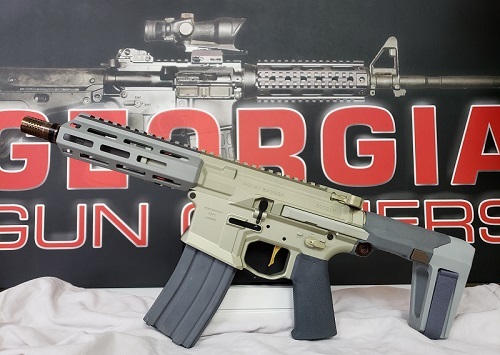 GGO is raffling off a “Honey Badger – Pistol by “Q” (picture below), with all proceeds going to programs aimed at exposing Georgians to Radical Stacey Abrams gun control agenda. Radio and web ads, direct mail, email, video production. None of it is cheap — but all very important for GGO to lead the charge in exposing Radical Stacey publicly. Even more importantly, virtually every part of the Honey Badger would be BANNED, CONFISCATED, and DESTROYED if Radical Stacey gets her way. So get your tickets by clicking here or below (all ticket purchases come with the Georgia Gun Owners all-new “Free Men” t-shirt — so don’t forget your t-shirt size)! The total value of the Honey Badger is $2,249. The raffle ends September 28, and the winner is selected October 3. Get your raffle tickets now (don’t forget your t-shirt size)!